The fast food giant has signed up to pilot test a new cloud-based NFC payments service developed by Austrian mobile network operator A1 and Paybox Bank. Supermarket chain Merkur will also participate in the trial. Austrian mobile network operator A1, a subsidiary of Telekom Austria Group, has announced that fast food giant McDonald’s and supermarket chain Merkur have signed up to take part in the pilot testing of a new mobile payments service called Paybox NFC. Like many NFC payments services being rolled out in Europe, the new service enables payments of up to €25 to be made without the need to enter a PIN. Unlike most others, however, the service is not based on EMV ‘chip and pin’ technology and doesn’t use either Visa’s PayWave or MasterCard’s PayPass solutions. Instead, Paybox NFC processes payments ‘in the cloud’ and merchants use a small Paybox NFC unit to handle mobile payments, rather than a contactless EMV point-of-sale terminal. The service is offered by A1 in conjunction with Paybox Bank, a wholly owned subsidiary of Telekom Austria which holds a full Austrian banking license and already offers a range of non-NFC mobile payments services. The service works with both NFC phones and contactless stickers — A1 currently offers five models of NFC phone: the HTC One X, Sony Xperia S, BlackBerry Curve 9360, BlackBerry Curve 9380 and the BlackBerry Bold 9900. To use the service, consumers will need an account with Paybox and to designate a bank account from which payments will be deducted. 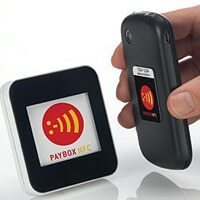 The customer’s Paybox account number and their mobile phone number are then coupled together in the back office and the consumer downloads the Paybox app to their mobile phone — no other identifying data, such as their bank account or mobile phone number, is stored in either the contactless sticker or the secure element on their NFC phone. Payments made with Paybox NFC are deducted a “few days later” directly from the bank account designated by the consumer when they opened their Paybox account. All data transmitted is encrypted, purchases are limited to an overall daily total of €50 and small purchases can be ‘rolled up’ so that one debit from their bank account is made for multiple transactions. Each payment take just half a second to process and customers receive a text message after each purchase, to confirm the amount charged. Five hundred people are taking part in the initial pilot test, due to run until mid-2012, at five Merkur supermarkets and four McDonald’s outlets. The service will then be “expanded to additional points of sale, business partners and payment services,” says A1. “At McDonald’s, we are constantly working to optimise the dining experience of our customers,” explains Andreas Schmidlechner, marketing and communications director for McDonald’s Austria. “In line with our motto ‘good fast food’, convenience and fast service play a crucial role. With the help of digital service concepts we can further improve our ordering and payment processes and make them simpler and more practical. “NFC opens up a wide range of new possibilities to speed up payment transactions so that customers can spend more time enjoying their meal in the restaurant or can order their take-away food more quickly and easily,” Schmidlechner adds. My understanding is that a unique user ID is stored in the phone’s NFC-enabled SIM (or the chip in the contactless sticker). I would expect that, for NFC phone users, there will also be an app that can be downloaded onto the phone’s main memory to provide a user interface for the service.